Adjustable Height: 13.5 to 16.5"
The white Digistand LPT02 is a folding DJ laptop stand designed to securely hold a laptop computer or tablet for mobile DJs playing gigs at clubs, house parties, and outdoor venues. The lightweight and durable frame is adjustable between 13.5" and 16.5" in height and folds flat for ease in transport. Unlike other models, the Digistand LPT02 has no complicated gears or hinges to tighten or loosen with every use. Instead, the stand simply locks into place with spring-loaded latches. The laptop tray is angled slightly downward for additional safety and comfort and can be rotated left or right for the perfect positioning in tight environments. The included rubber rings and sleeves protect the laptop and work surface from scratches while guarding against slipping and sliding. The Digistand LPT02 ships with a carrying pouch. 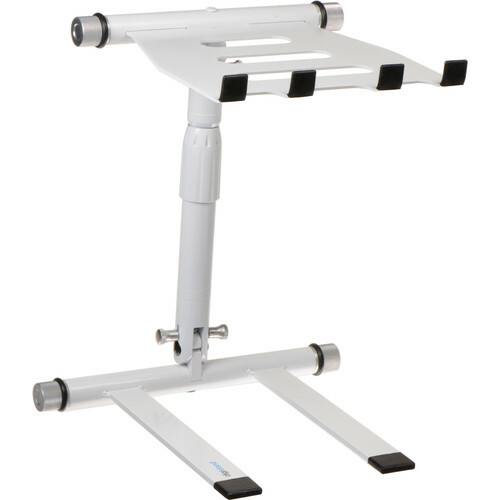 Box Dimensions (LxWxH) 12.6 x 11.9 x 2.8"
LPT02 Folding DJ Laptop Stand (White) is rated 1.0 out of 5 by 1. Rated 1 out of 5 by Michael from Horrible stand. You would get better results velcro-ing your laptop to a bobble head. There is so much play in this thing you would get better results trying to type in a row boat in a hurricane. Very disappointed.